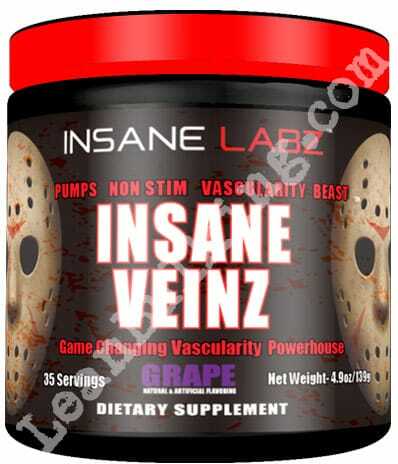 Insane Veinz is a pre-workout supplement made by Insane Labz. It's priced at $54.95 for 35 serving containers, and comes in two flavors - Grape or Fruit Punch, but you can also get it unflavored. Insane Labz are "a company committed to bringing you cutting edge products". This means they try to offer you the most modern products on the market. We like that their supplements are made in FDA registered cGMP certified facilities, so you know that they're safe. Every product that you buy should be made in these facilities. However, this is the first time we've heard about this company. Insane Veinz only has 4 ingredients inside, so we'll take you through these really quickly. Ultimately, the ingredients (and their dosages) determine how effective a product is. So it's important to check whether the ingredients work. But there's a problem straight away here - Insane Veinz contains a proprietary blend. Answer: Because you don't know the exact doses of each ingredient inside them. 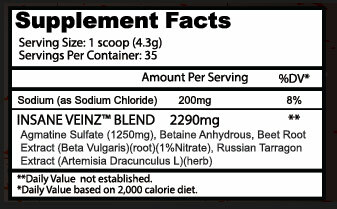 You can see that the 'Insane Veinz Blend's overall quantity is 2290mg. But you're left guessing the doses of Beetroot Extract and other ingredients. This is most commonly used to alleviate pain and treat drug addiction. So why's it inside a pre-workout? Well, it's believed to elevate your nitric oxide levels - which would result in enhanced muscle pumps in the gym. But no studies have actually proven that Agmatine Sulfate works. Ultimately, it's an unproven and unreliable ingredient. This is the worst ingredient inside Insane Veinz, but you'll find it in many pre-workouts. Because it's believed increase strength and muscular endurance in the gym. However studies have shown that it doesn't provide any benefits. Not only that, it causes fishy odors in your breath and body secretions. This is the best ingredient inside Insane Veinz. Beetroot Extract contains a high level of nitrates. Why's this good? Answer: It helps boost your nitric oxide production. This leads to you experiencing intense muscle pumps in the gym. And muscle pumps improve your strength, and endurance while you lift weights. It's a key pre-workout ingredient for a reason - it works. But there's a problem with the dosing here. Beetroot Extract is part of the 'Insane Veinz Blend', so you don't know the exact dosage inside. For this reason, we're giving it a 4 star (as there could be a tiny amount inside). This herb is believed to improve sporting performance. However, there haven't been any studies to prove that it works. Ultimately, it's an unreliable ingredient that's not likely to be effective. The only ingredient inside Insane Veinz that can cause side effects is Betaine. Fishy odors in your breath and body secretions (Betaine). This isn't a great pre-workout supplement. The only ingredient that's proven to work inside Insane Veinz is Beetroot Extract. The other ingredients are unreliable, and Betaine can cause an unwanted side effect. We recommend that you stay away from supplements containing proprietary blends. Answer: These are the biggest gimmicks in the supplements industry. Companies often fill proprietary blends with ineffective ingredients to cut costs.